Don&apos;t forget to like and subscribe! <<The words appear to be of fourteenth century origin and may have been copied by Hannah from an earlier collection of tales lying in her father&apos;s library, or perhaps she composed them herself. 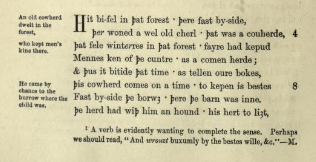 "The menskful wight swich tales kepe ful dernly and ful yerne, shal wite the lay of Briton clerkys and ancien sothe shal leren." @natecull you don't happen to know where I can find the Middle English version? @lizardsquid I don&apos;t, sorry! Only just discovered this site. At least I think this might be it? It drops into French occasionally because some folios are lost. @natecull I also like how the author often goes "describing all this would be way to long, just assume it's good"
@natecull Dont trust the dictionary on gender terms. Especially not dictionaries that define "woman" to mean female, as if you check someone's junk every time you use the term to see if that's what that person is. "Except for the old-style language of that poem, its use of singular they to refer to an unnamed person seems very modern." This is a word game - older words were already used for neutral & indeterminate-gender personal meaning in Germanic languages, including using those for ppl while using 'it' as an impersonal pronoun, this word just displaced one case of one pronoun. This article deliberately frames the singular they politicly & as an emergent idea about what gender is, when the idea itself is represented through older language. Proto-Indo-European had a very different pronoun system from modern English, & Germanic langs had words 4 ppl unrelated to he-she-it that were neutral-indeterminate personal pronouns.